Processing a transaction is as simple as scanning a bin and a quantity. ScanVend takes care of the rest. Transactions are processed into our database where they can be accessed through the Internet any time of the day. Hundreds of locations anywhere in the country can be administered from your customized website, letting you track and reduce consumption. 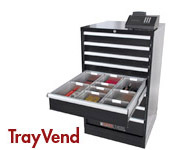 ScanVend accommodates any style of inventory storage, including drawers, cabinets, trays, bins, and shelves. 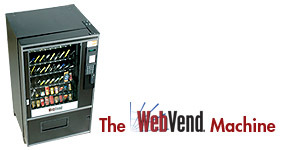 TrayVend from WebVend provides controlled inventory access to over 200 inventory items where you need it most, at the point of use. The large drawer size and adjustable compartments make it adaptable enough to satisfy almost any need. Controlled inventory is available all day, every day. Getting a tool is simple as swiping your card, opening a drawer, and logging the bin and quantity taken. 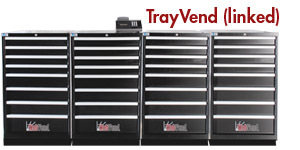 Up to four cabinets can be linked together as one system to expand inventory availability and convenience.